Discussion in 'Canon InkJet Printers' started by Photog, Mar 11, 2014. Ahh. You did #3 from my post #14? There is method to the madness in troubleshooting. Now you may be able to clear the clogged purge tube and replace your waste ink pads, reset the counter in Service Mode, and then be good as new, so to speak. Finally, success.....after one failure. I took the printer apart enough to get to the hoses leading to and from the pump and flushed them out with Windex using a syringe. Afraid to go take more apart to access the pump, I reassembled and tested. No joy. Same as before. Today I gave it my final shot and assumed I'd never get the rascal together again, much less get it working. Got into the pump. Cleaned the dirty PGBK tube in it, but the main culprit was the connector from the small PGBK purge pad tube to the larger pump tube. For some odd design reason, the ink makes a 90 degrees turn in the connector, and that connector was solidly clogged. Used a syringe with a very thin needle to dig out and flush out the gunk. Reassembled, scratched head over leftover screws, and tested. Perfect!!! pharmacist, palombian, Nifty and 5 others like this. Those plastic manifolds in the pump assemblies have some small holes. I've had to unclog them with fine wires. jimbo123 and The Hat like this. Very happy to hear you have fixed the problem and can now return to happy printing. jimbo123, The Hat and PeterBJ like this. Now that I remember I had the same problem with pigment black not printing well when I used Hobbicolors pigment black. Remedy was disposing of the cartridge and buying a new OEM no more problems. When I saw that problem I bought some empty PGI-5 carts preventing any problem and avoiding to pay for an expensive PGI and keeping spare virgin carts. When virgin carts were refilled I got the same problem again, so only installing a new OEM got rid of the flow problem. Servicing a Pixma IP4500 I found the same Jello pigment build up. I just remove the gum with a knife, washed the ink absorber and back to bussiness, also noted that when printing photos corners on photo paper were coming out a little stained. I thought there was a curl in the paper and getting smeared by all colors resulting in black stain, but now I know it was pigment black. 2 printheads always looked like the picture below, always wet in the pigment black area, this didn´t happen with any other ink. Purge unit was a little messy too. It seems inks is very fluid, but this in order to prevent clogging. Maybe someone has a point of view for this. Prints with pigment black were good, but with this particularity in the printhead and purge pad area. One thing I liked of Hobbicolors pigment is that it is very black, IS ink is not so black, OCP is even less black than IS, with a strong odor, but clog free. Shaking the pigment ink bottle is a good thing to do, so the pigment particles settled in the bottom are mixed, this way you wont draw "thick" ink. A good way to prevent build-up of pigment black on the underside of the print head is to set “Print Quality” to standard and not high, you won’t notice any difference in output. One of the best Pigment inks for the desktop printer IMO, is KMP black, it is an exceptionally good ink.. This was seen in printers that were exclusively dedicated to photo printing, the pigment black was not used. Other printer I had that printed text maybe 100+ sheets daily in fast mode had the same problem. I used the high quality just few times when large solid black areas needed to be perfect with no streaks. Well if you still get excessive build up on the underside of the heads then I would recommend flooding the capping station (Purge area) and giving it a general clean up with some paper towels, it can only help. It never represented a problem when printing text, but with paper photo smeared in 2 corners of the same side. This was when using Hobbicolors pigment, now I am using IS pigment ink. 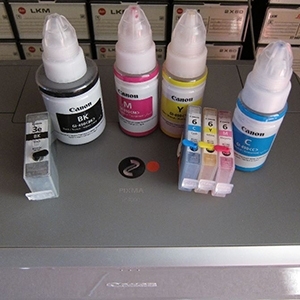 Almost 3 liters of OCP pigment black were used in my printers, but I don´t remember if the printhead had the same wetting and smearing as Hobbicolors. Image Specialists pigment is indeed good, only thing I noted is that a printer left unused in maybe a month or so, produced a totally missing black pattern in the nozzle check, no signs of PBGK at all.